Volume 3, the final in the trilogy, covers in the history of New Zealand, largely in chronological form, from 1800 to 1840, which includes events and decisions in Australia that impacted on New Zealand, of which there were much more than present-day people might assume. Events be... read full description below. 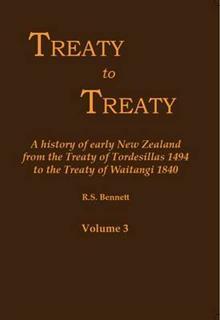 Volume 3, the final in the trilogy, covers in the history of New Zealand, largely in chronological form, from 1800 to 1840, which includes events and decisions in Australia that impacted on New Zealand, of which there were much more than present-day people might assume. Events beyond 1840 are mentioned to show how the Treaty of Waitangi was finally accepted in 1901 when representatives of almost all tribes met the future King George V and Queen Mary at Rotorua, pledged loyalty and presented precious heirlooms as gifts.